Kings Heath (historically, and still occasionally King's Heath) is a suburb of south Birmingham, England, five miles south of the city centre. 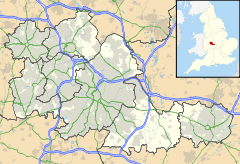 It is the next suburb south from Moseley on the A435, Alcester road. Kings Heath came into being as a village in the 18th century with the improvements to the Alcester to Birmingham road acting as a catalyst for new houses and farms. Prior to this the area was largely uninhabited wasteland run by the Royal Borough of Kings Norton. The streets running off High Street are dominated by pre-1919 terraced, owner occupied housing. A number of independent shops have taken advantage of relatively cheaper rents in the side roads off High Street, and recently there has been an influx of boutiques and even the start of an (organic) café culture. In 2008, the businesses agreed to a Business Improvement District, which top-slices a proportion of their local business taxes to go directly into improvements and promotion of the area. The locals still refer to Kings Heath as a 'village' even though it has been part of Birmingham for over a century. Its centre at the Vicarage Road junction has now been developed to form an attractive public square which is used as a venue for the monthly farmers' market and other events. On 28 July 2005, Kings Heath was hit by a major (by European standards) tornado which damaged several shops on High Street and All Saints' Church. The tornado then went on to damage many houses in Balsall Heath. There were no fatalities. Kings Heath is also home to several schools including Colmore Infant,Nursery and primary School, St. Dunstans, Kings Heath Primary School, Kings Heath Boys, Wheelers Lane Technology College, King Edward VI Camp Hill School for Boys, King Edward VI Camp Hill School for Girls and Bishop Challoner Catholic College. The central shopping area runs along High Street and Alcester Road, and the shops include branches of national chain stores, charity shops, supermarkets, electrical retailers and opticians. There are also a number of pubs, churches and schools on and around High Street. Plaque marking UB40's first gig. Kings Heath contains two parks: Kings Heath Park and Highbury Park, the former being famous as the setting for the popular ATV series Gardening Today. Kings Heath Park also features a Victorian-styled tea room and is the venue for the annual Gardener's Weekend Show, which comes under the Royal Horticultural Society and is one of the top regional events for gardening enthusiasts to show off their vegetables and floral displays etc. The park has 'green flag' status. Highbury Park (on the border with Moseley) is adjacent to the Highbury Hall, which used to be a residence of Joseph Chamberlain. 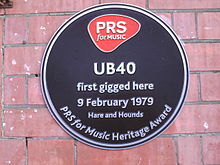 The Hare and Hounds public house, in Kings Heath High Street, was the location of the first concert by UB40 on 9 February 1979, which is commemorated by a PRS for Music plaque. The pub was rebuilt in 1907, but is Grade II listed, as it has retained many original Art Nouveau internal fixtures. The pub is still an important local music venue. The 2011 musical film Turbulence was shot in the area, with much of the film's action taking place in the Hare & Hounds pub. The 2013 song "Green Garden" by Birmingham born Laura Mvula is an elegy to her home in Kings Heath. The BBC documentary Fighting For Air, about suburban air pollution, was filmed in Kings Heath in 2017 and broadcast on BBC2 on 10 January 2018. Kings Heath Stadium existed from 1927-1971, it hosted greyhound racing. ^ "Village Square". All Saints Centre Kings Heath. All Saints Community Development Company. Retrieved 8 September 2017. ^ Buxton, Roddy. "Studio One". Archived from the original on 8 January 2008. Retrieved 12 April 2002. ^ "Hare and Hounds, The Venue". Hare and Hounds. Retrieved 1 October 2012. ^ Suart, Paul (15 July 2011). "Kings Heath film maker turns to bike power for new movie". Birmingham Mail. Trinity Mirror Midlands. Retrieved 8 September 2017. ^ "'Fighting For Air' BBC2 documentary broadcast 10 January 2018". Kings Heath Residents' Forum. 8 January 2018. Retrieved 18 March 2018. ^ Tarter, P Howard (1949). Greyhound Racing Encyclopedia. Fleet Publishing Company Ltd. p. 62. ^ Mike Lockley (17 February 2013). "Plaque to be erected for Kings Heath Cluedo inventor Anthony Pratt". Birmingham Mail.